My mother’s day present from the husband was to do whatever I felt like doing while he took care of ‘everything else’– so first I finished the last armband on the Celtic Lattice vest, washed it and pinned it to block, and then I trekked up here and began going through all the crap covering my bedroom. We used to have a very large room that neither of us spent any real time in. Wasted space, big time. When we first bought this house, I had fond dreams of spending hours in here – it is a lovely, bright, airy room, awesome lighting for any craft you care to do. And so big! HUGE! I mean, HUGE-HUGE! Our master bedroom is almost as big as my entire first apartment, all kidding aside. 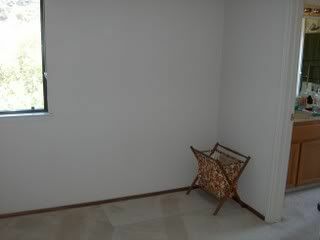 All right, it is a little short on ‘sitting’ implements and table and other stuff that tends to be considered standard for a knitting nook (or anything else except what this may seem to be to the unimaginative eye, to wit, an empty corner). But it does have a knitting basket in it, so it counts. Yes. That weird stuff on the wall is unfinished drywall texturing. 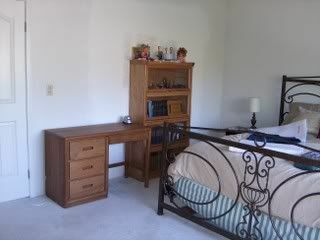 It used to open into a retreat off the master bedroom, which we walled off to make a room for Captain Adventure. I don't want to talk about how long ago that was, or why we haven't painted either space yet. 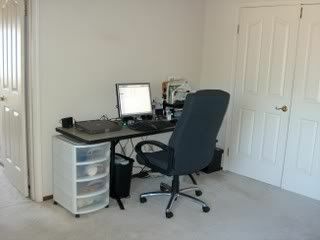 Eventually, I want to get a nice comfy chair and a good sturdy little table to go in my ‘knitting nook’; for right now, cash is tight so I’m saying that the office chair is perfectly comfortable, thank you. I’ll repurpose something from around the Den to be a footrest (hmm, Captain Adventure is about the right size…) (oh wait, using a small child for a footrest…would that be wrong?!) and call it done for now. I’m sure that if one of the ‘trading spaces’ decorators were to walk in here, they’d drop dead of bad-designing induced heart failure. Oh yeah. Life is good. I’m going to go bring what little of my stash is actually here and not in storage up to its new home. And the vest being all done but the shouting, maybe start something new before dinner. I had promised myself that I would alternate ‘one for me, one for charity’, so I’m thinking I’ll cast on a cute little baby sweater or something. In my room. Oooooh, I feel like a teenager again! Let me practice. …oh yeah, I feel youthful all over…! Elder Son keeps saying he is moving out. I keep bringing home paint swatches. Enjoy your room! I have a HUGE bedroom that is mostly full of junk. I need to do what you did but the very though exhausts me! Good job! What the heck just happened here? Wrists Hurt. Need chocolate. And also beer.